Small and I were charged with supplying “city food” for 17 preschoolers today. My first thought was to steam hot dogs and serve them in stale buns; my next was to make sushi rolls. 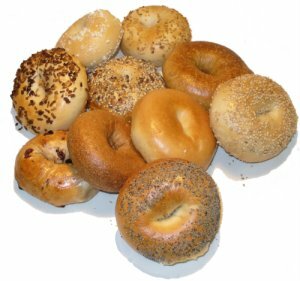 I settled on a more palatable mid-morning snack and something infinitely easier for me to provide – fresh bagels. Alright, I didn’t really say that last bit. I just thought it. Don’t mess with me before I’m fully caffeinated. You deserve credit for not saying it out loud! funny stuff. I can occasionally hold my tongue. Thanks for stopping by! Thanks for stopping by, Crystal!